M.C. Escher’s artwork, nature, and geometric shapes inspired ‘Jun’ for his textile prints on wool, cotton and faux fur. Born and raised in Seoul, South Korea, Jun has accepted the position of associate creative designer at General Motors. The refined classic and comfortable aesthetic of James Dean was the inspiration for the fashion designers who collaborated on this collection using Jun’s textiles. Designers include Jaime Cole, Desiree Daniels, Lauren Hume, Johanna Hatzenbuehler, Anne Jones, Muriel Jordan, Kara Laricks, Aurelie Martin-Chiari, and Warot Subsrisunjai. 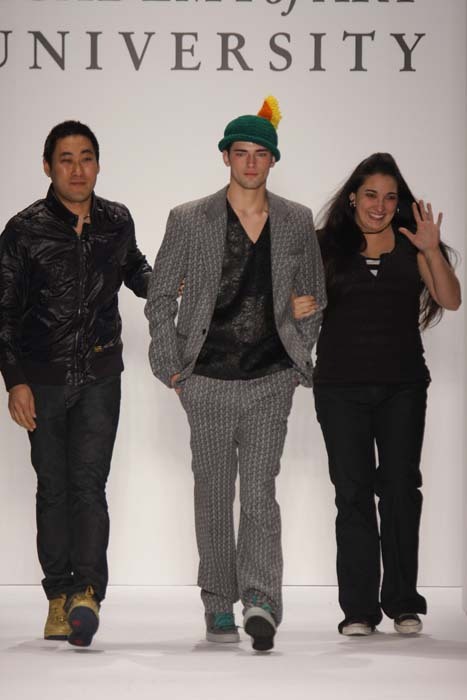 Textile designer Young ‘Jun’ Ryu, model Sean O, and fashion designer Jaime Cole taking their bow on the runway.